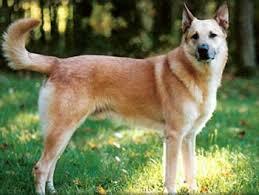 The Chinook was developed in the United States as a sled dog whose function was drafting and sled dog racing. Bred to combine the power of freighting breeds with the speed of the lighter racing sled dogs, he is an athletic, hard bodied dog showing good forward reach and rear extension in a seemingly tireless gait. The Chinook is an impressive dog, with an aquiline muzzle, dark almond eyes, black eye markings, a variety of ear carriages, and a tawny, close fitting coat. His saber tail is held in a graceful sickle curve. The male should appear unquestionably masculine; the female should have a distinctly feminine look and be judged equally with the male. A dignified and affectionate family dog, the Chinook is known for his love of children. The Chinook is to be presented in a natural condition with no trimming. The following is a description of the ideal Chinook. The Chinook is a slow maturing breed. Size - Ideal height at the withers: males 24 to 26 inches; females 22 to 24 inches. Proportion - When measuring from point of shoulder to the point of buttocks the Chinook is slightly longer than tall. The proportion of height to length of body being as 9:10 in ratio. Substance - Muscular with moderate bone, a gender difference is easily discernible. The Chinook exemplifies a sound athlete in grace, muscle tone, movement, and carriage. The head is broad, wedge-shaped, and impressive but in balance with the size of the dog. Cheeks are well-developed and slightly rounded. The expression is intelligent, inquisitive and kind. The eyes are medium in size and almond in shape with black rims. The eye can be any shade of brown but dark brown is preferred. Dark markings around the eye that accentuate the eye and give character are desirable. Extended black pigment in an apostrophe shape at the inner corner of each eye is preferred. Disqualification-Any eye color other than brown. The ears are set near the top line of the skull. They are medium in size, V-shaped, and slightly rounded at the tip. The ear tip should be just long enough to reach the inside corner of the eye. Any ear type is allowed, including drop, prick, or propeller ears that maintain a fold when at attention. For aesthetic purposes, dropped and matched ears are preferred. The topskull is broad and slightly arched between the ears. When viewed from above, the topskull is almost square, gradually narrowing and flattening on top as it approaches the eyes. The stop is moderate and marked with a central furrow extending up the top skull. The muzzle is aquiline and shorter in length than the top skull, measuring from nose to stop as 2:3 in ratio with stop to occiput. Viewed from the front, the muzzle is tapered to form a blunt wedge. Viewed from the side, the top of the muzzle to the nasal cartilage and the top skull are almost parallel. The nose is large, prominent and the leather is solid black. The lips are black. Bite - The Chinook has a full complement of strong teeth meeting in a scissors or a level bite. The neck is strong, balanced in length, arched, and covered with fur that forms a protective ruff. The skin on the neck is pliable but a pendulous dewlap is a fault. The neck blends smoothly into the withers. Topline - The back is straight, strong and level, with no sign of weakness. There is a slight arch over the loins. Faults-sloping topline, roach or sway back. The body is well muscled and hard. The chest is moderately broad, well filled and deep, and neither too broad or too narrow. The forechest has a prominent prosternum that extends beyond the point of shoulders when viewed from the side. The brisket reaches to or nearly to the elbows. The ribs are well sprung, oval in shape, flattening toward the lower end to allow for elbow clearance and efficient movement. The loins are muscular with a slight arch, having enough length to be athletic but still in proportion. The underline has a moderate tuck-up. The croup is muscular, slightly sloping, broad and without exaggeration. Faults-Narrow or barrel chest, dropped croup. Tail - The saber tail is moderately set just below the level of the topline and is well coated with distinct but moderate fringing. It is broad at the base, tapering to the end and reaches to the hock with a slight curve at the tip when relaxed. When alert or moving, the tail is carried in a graceful sickle curve, neither curling to the side of the body nor touching the back. The tail should never be docked. Faults-low or high tail set. The shoulders are moderately laid back with the shoulder and upper arm forming an angle of approximately 110 degrees. The shoulder blade and upper arm are equal in length. The forelegs are straight, well-muscled, with moderate, oval bone. When viewed from the front, the legs are parallel, and straight. The elbows turn neither in nor out. The pasterns are flexible, moderate in length, strong, and slightly sloping when viewed from the side. Dewclaws may be removed. The feet are tight, oval in shape, with arched toes, webbing between the toes, and with strong nails. The pads are thick, tough, and darkly pigmented. The front feet may turn slightly outward when standing. The hindquarters are muscular and strong, moderately angulated, and in balance with the forequarters. The slope of the pelvis is approximately 30 degrees off the horizontal with the angle of the stifle at about 110 degrees. The upper and lower thigh muscles are well-defined. The rear pasterns are parallel to each other, and perpendicular to the ground when viewed from any angle. The rear feet point straight ahead. Rear dewclaws must be removed. The Chinook has a thick double coat lying close to the body. The outer coat is straight, strong, and coarse. The length of the outer coat is longer over the ruff, shoulder blades, withers, breeches, and along the underline and the underside of the tail but is never so long as to obscure the clean-cut outline of the dog. The undercoat is short and dense, downy in texture, providing insulation. The groin and inside of the rear legs are protected by coat. A winter coat feels soft and plush with coarser hair following the topline. A summer coat may be thinner, feel coarser, and should not be penalized. The tail is well-furred with feathering starting about four to five inches from the root. There is slight feathering of shorter hair along the back of the forelegs. The Chinook is shown naturally and trimming is not acceptable. Faults-Thin, sparse, or excessively short coat, long, rough, or shaggy coat, unprotected belly and/or groin. Trimming of the coat is to be severely penalized. Tawny coloration, ranging from a pale honey to a deep reddish-gold, is a distinguishing characteristic of the Chinook. Dilute tawny, and its associated diluted pigmentation of nose, lips, pads, and eye rims, is acceptable but not preferred. It is desirable for the ears and muzzle to have darker coloring than the body. This darker ear and muzzle coloring runs from a tawny that is darker than the body to a black shading, with some black shading being the most preferred. A black apostrophe shape mark at the inner corner of each eye is desirable. Symmetrical white or cream to pale gold markings are acceptable on the cheeks, throat, chest, breeches, and underside. Any other white markings are undesirable including blazes, socks, and scarves. DisqualificationAny color other than tawny as described. The Chinook's gait is smooth, easy, and seemingly tireless. When viewed from the side, there should be good reach in the front and good extension in the rear, covering ground with minimal effort. Viewed from behind, the rear pads should be fully visible. The back is strong and level when gaiting. As speed increases, the feet tend to converge toward a center line of gravity. The Chinook is an affectionate and playful family companion with a special devotion toward children. He is a willing worker who is eager to please and enthusiastic to learn. The Chinook is highly trainable, adaptable, and versatile in his abilities. Gregarious with other dogs, the Chinook works well in teams and within family packs. The Chinook is a dignified dog and some Chinooks may be reserved with strangers but should never appear shy or aggressive. Variations are penalized to the extent of the deviations. Any eye color other than brown. Any color other than tawny as described in this standard. Click Here to Learn about breeder background checks on Chinook breeders if you are looking for Chinook puppies for sale. Click Here to learn how ResearchBreeder.com can help you find healthy Chinook puppies for sale. Click Here to order a Breeder or Kennel Background Check on Chinook Breeders that may have Chinook puppies for sale. Click here to find the national breed club for Chinook puppies for sale. Click Here to purchase a list of approved ResearchBreeder.com Chinook Breeders who have Chinook puppies for sale.